What does the longevity of your current job position look like? Do you have a plan for your retirement? What about when you are unable to carry that 60-pound dog across the room to get him into surgery? The veterinary technician profession is not only emotionally and mentally challenging, it also takes a physical toll. Many of us concentrate so hard on being a great veterinary technician that we don’t think about the physical demands until it is too late. Fortunately, there are opportunities for advancement within our profession that allow us to escape some of the physical stress, yet still work closely with clients, pets, and our team. One such avenue is to develop your business acumen and become a certified veterinary practice manager (CVPM). Sound interesting? Veterinary practice managers assist in all aspects of day-to-day practice operations, including team culture, human resources, financial reporting, inventory control, expense management, client interactions, and much more. All too often, practice owners become overburdened with trying to manage all these responsibilities in addition to practicing medicine. For many, their first instinct is to move their head veterinary technician into a management position—ready or not. Unfortunately, this promotion often comes with little guidance, training, or support, which typically does not work out well for either party. CVPMs are trained to take the daily responsibility of running the practice off the owner–veterinarian’s plate, allowing him or her to focus on medicine and thereby improving the efficiency and profitability of the practice. How do I become a CVPM? The Veterinary Hospital Managers Association (VHMA) created the CVPM certification program in 1989. The VHMA website, vhma.org, contains useful information about all aspects of practice management, including support for those willing to pursue certification. The VHMA has been instrumental in helping veterinarians and managers improve veterinary businesses since 1981. Candidates who have completed all the prerequisites can apply for the opportunity to sit for the national certification exam. VETERINARY PRACTICE MANAGERS assist in all aspects of day-to-day practice operations, including team culture, human resources, financial reporting, inventory control, expense management, and client interactions. As you can see, becoming certified is not an easy process. It requires dedication and persistence. Instead of looking at these requirements as hurdles, consider them stepping stones to becoming one of the few who can call themselves a CVPM. Currently, only about 400 professionals throughout the entire world have successfully achieved CVPM certification. What are the advantages of becoming a CVPM? Are you ready to get started on advancing your career? How do I start the certification process? Where can you find opportunities to obtain 48 CE credits in management? Options for CE range from local events to large national conferences such as those run by the American Animal Hospital Association (AAHA), American Veterinary Medical Association (AVMA), CVC, North American Veterinary Community (NAVC), and WVC. If you haven’t yet had the opportunity to attend one of the larger national veterinary conferences, you should consider investigating the possibility, as you may be able to acquire most of your credits at one time. I had the opportunity to attend the AVMA conference in July 2014 in Denver, Colorado. It was an incredible experience. Between the classes taught by experts from all over the world to the numerous networking opportunities, it was great! If you can’t attend a large national conference, webinars and practice management classes taught by CVPMs are also available, and the VHMA website has registered practice management groups for many states. Check to see if you have a practice managers’ group nearby. Attending these local meetings is a great way to network with managers in your area, and the CE can be applied toward your needed credits. In addition to obtaining CE credits, you will need to take appropriate management classes. If you already have college credits, you can submit your unofficial transcripts to the VHMA office for review to get a better idea of what classes you need. I was fortunate enough to find a local community college that offered various business and management classes at an affordable price. Additionally, I took online classes at my own pace while working as an active practice manager. Once you have completed all the requirements and submitted your application with all the necessary documentation and deposit, the approval process begins. Use this time to prepare for the actual examination. Prepping for your CVPM examination is a challenging process. 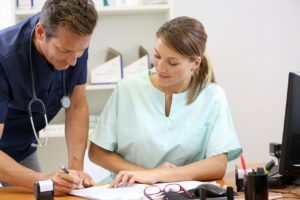 The examination requires you to be knowledgeable in many areas, including employment regulations, the AVMA Model Veterinary Practice Act, Drug Enforcement Agency regulations, Occupational Safety and Health Administration standards, inventory control, drug calculations for usage, financial reporting, and various other aspects of veterinary medicine and business. Where do you start? Several resources for CVPM test preparation exist (BOX 1). You can attend veterinary-specific management curricula, such as those offered by Veterinary Management Consultation (VMC), Purdue, and AAHA, in a classroom setting. The VHMA also offers The CVPM Preparation Workbook and webinars. The workbook can be an essential resource to assist you through the entire process of CVPM certification. It provides candidates with the tools they need to prepare for, and to streamline the process of eligibility to sit for, the exam. For me, as someone who has recently submitted my CVPM application, it’s challenging to break away from the day-to-day operations of the practice and find classroom time to study and prepare for the examination. My plan is to use self-paced, online courses such as those on vetmedteam.com and vspn.org as much as possible. Additionally, I have a phone app (BOX 1) that provides sample questions for study purposes. Zoonosis: What Is All the Fuss About?